Because we are small and work locally in Dorking, Surrey, we don’t have excessive call-out charges or high overheads. If you can wait until we’re passing, our minimum charge is just £30 plus any parts. 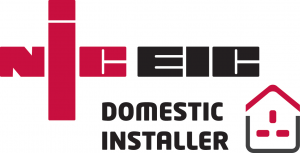 We’re an NICEIC approved Domestic Installer, which means we’re fully authorised as registered competent persons to perform and certify domestic electrical work safely and legally under Part P of the Building Regulations. Nuisance electrical problems – such as a tripping circuit breaker or flickering lights, can be tell-tale signs of more serious faults. Our electrician will fix the problem before it becomes unusable – or unsafe. We’re available 24/7, right here in Dorking, Surrey. Unlock a world of light. Low energy lights used to be known for being dim, slow to turn on, and a poor quality of light. But LED has changed all that. New LED lights use special built-in light sources that never need changing – and give a bright, high-quality light perfect for any task. Best of all, the cost of LEDs is now so low that you’ll have your money back within months, from the savings you make on electricity alone. Perhaps the best things about LEDs is that they can be very attractive indeed – with filament bulbs available in a range of modern and vintage styles, as well as discrete ‘opal’ bulbs and bright, crisp downlights. Get the very latest look – and cut your bills too. As always some products are much better than others – so be sure to contact us for advice.